Developed by the Colorado Department of Education, The Colorado Education Initiative, and The Learning Accelerator, the Community Collaboration for School Innovation toolkit helps districts shift away from a community engagement model that centers around districts pushing information out, to a new collaboration model that instead encourages districts to pull in guidance from the community, and leverage that input to drive innovations. What do graduates from this school district need in the 21st century to be successful? How do we prepare the students in this district for a rapidly changing economy? How do we ensure that all students are being well served in our district? What do you hope and expect students in this district will know and be able to do? What could learning environments in this district look like to ensure that students are prepared for the world once they graduate? The input districts receive from the community will influence future, developing, and existing initiatives and innovations. The Community Collaboration for School Innovation toolkit will assist district staff and board members as they move through the process of adopting the community collaboration model in their local communities. 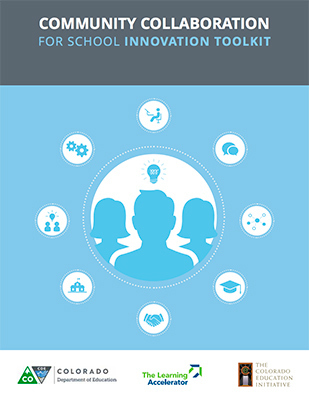 The guide includes real-world case studies from Colorado school districts, video trainings, and templates.